The mission is a single one and fairly simple (and quite fun sounding)... for all requirements click HERE. 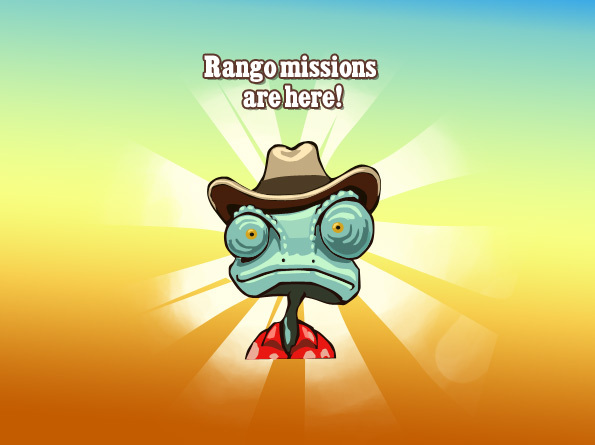 One of the aspects of the mission will be the appearance of Rango on our homesteads where we'll have to click him to "catch" him, just in the same way as any of the popup bonuses, coins, XP etc. It appears he'll appear randomly from a number of places, possibly appearing everywhere in the same way as the resolutions collections etc. Once you "catch" him it not only counts towards the mission but also towards a set of badges that are specific to this mission, in fact, the requirements for the final badge is the same as the requirement for the mission so it's unlikely anyone will miss out on collecting these. Rango Badge 3: Catch Rango nine times - Reward: 300 coins, 1 Rango Statue. Looks like it'll be a simple enough mission and will probably be a bit of fun... plus a chance to get a Tools, which is never something to be frowned upon! Well, we've had the Chicken Coops expanding to hold the chooks, and now we're getting another expansion, one that we know folks have been after for ages.... Some more storage space! Get those toolbelts on and the spare wood you have around because it seems we're going to be putting up some new shelves in our sheds and possibly even giving it another storey! We're not sure about the design of the shed but we don't think it's going to change the way it looks on your homestead, just give you a higher number in your storage capacity. Coming soon will be a three mission thread of repeatable goals that we can do again and again to boost our storage by 15 spaces each time so, if you can keep finding all the resources you've got almost endless storage opportunities! The mission will, we believe, be bought from the market first and then can be bought again once you complete the third Expansion mission. It's fair to say these are very heavy missions for resources and for time. 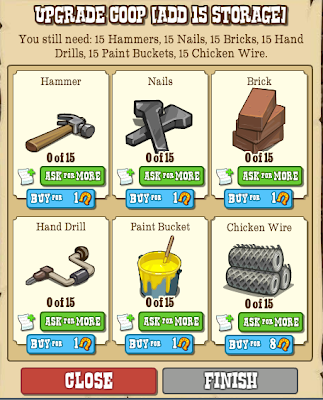 With a need for 25 cloth, 16 tools, 100 planks (totalling 700 wood and 25000 coins) and 8 sawhorses (totalling 40 planks which you'll have and 16 tools which again you'll have) these are NOT easy missions. That said they shouldn't be, Storage is one of the most requested, most desired parts of the game and it's right that these are difficult missions and might take some time. It's almost here - Let's get prepared! We all love expansions right? If you are anything like me right now, you will NEED some more room. Even if you feel you already have enough space the chances are you are going to want to complete the expansions ASAP. The last expansion was time consuming and came at the same time as a lot of different missions. 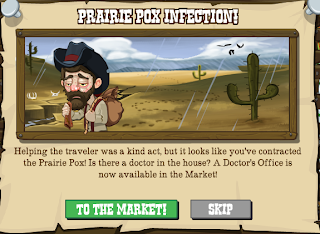 The 37x37 missions may look less difficult but scratching beneath the surface of the requirements, even the most seasoned Frontierville addict might feel a little panic stricken. So what will you need and where can you find it? The list of all the missions are HERE so lets break the resource requirements down. Time to start visiting neighbours, turning in cotton/flax/sheep collections, and clicking on as many cloth rewards you can find. You are going to need this to create things like Fire, Beds and Land Grants. You will need wood to make planks and fire which is needed for Powder Kegs, and Feather Beds. Wood is collected when chopping your own or neighbors trees - or collecting from the Daily Bonus at the Sawmill. All those times you didn't click on your friends posting on your wall when they unwithered your crops or hired you, will now come back to haunt you. So now is the time to let some crops wither - post up and tell your neighbours that you would really like them to post the reward - you can do the same for hiring. If all else is lost you can redeem your Postcard, Crafting or General Store collections for a few Tools - but I think you ought to talk yourself out of that personally! You will need to craft 4 Land Grants in the Land Office once you complete the missions. We also have a SHOW YOUR HOMESTEAD AND WIN contest taking place at our Facebook fanpage where you can win all the resource materials - so enter your homestead, get most "likes" and experience a stress free expansion. The one thing we cannot offer you is Cacti, Sorry! Good Luck Everyone! Happy Expanding! It's what we've been after for ages... Expansions to our chicken coops and a chance to store those foul fowls away from view, and more importantly, away from killing the servers every time they load! 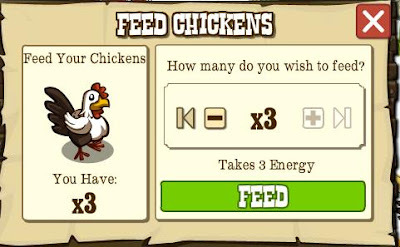 We know that those darn chickens and their farmers are one of the worst issues for server problems so hopefully this might help fix that. 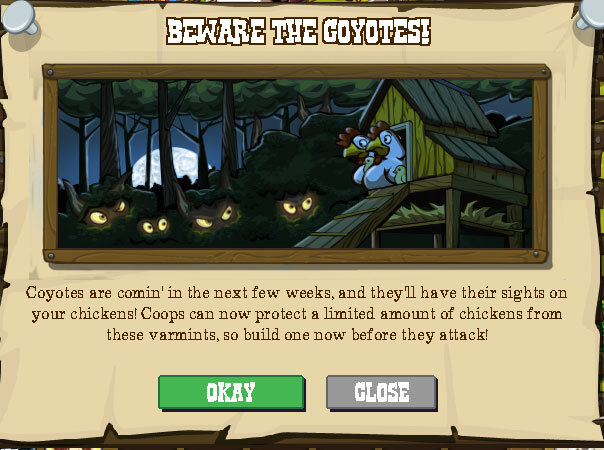 The main reason for these coops are apparently a new varmint coming to town, the Coyote! It seems chickens inside coops are deemed to be "Protected" so best pray for any left outside! The coyote missions are found HERE. 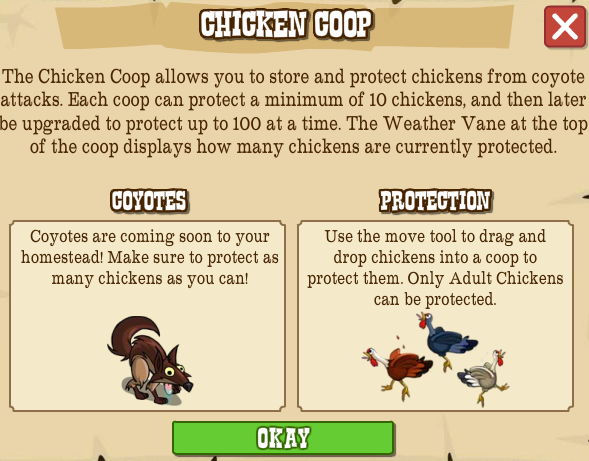 All current coops will be upgraded to the new version which will store 10 chickens and include a weathervane on top that will be used to show how full a coop is at any given time. There is now a limit of four coops per homestead. Then, once the expansions are completed you'll be able to store increasing amounts chickens inside the coop and collect from them in much the same way as the coops work in Farmville. You need to have completed the Apple Pie Contest mission and start the expansion by clicking on the coop and selecting the upgrade option. 15 Bricks, 15 Drills, 15 Hammers, 15 Nails, 15 Paint & 15 of the new specific request item, chicken wires. That's for the FIRST expansion, of which there are four. As you expand you'll be able to fit more and more adult chickens in with the first expansion allowing 25 chickens to be stored (per expanded coop) up to the fourth which will allow 100. Level 1 protect 10 - Default Build, 10 of each basic building supply. The collection that comes from the coop and what you can craft stays the same, but obviously the biggest addition is the ability to store adult chickens. 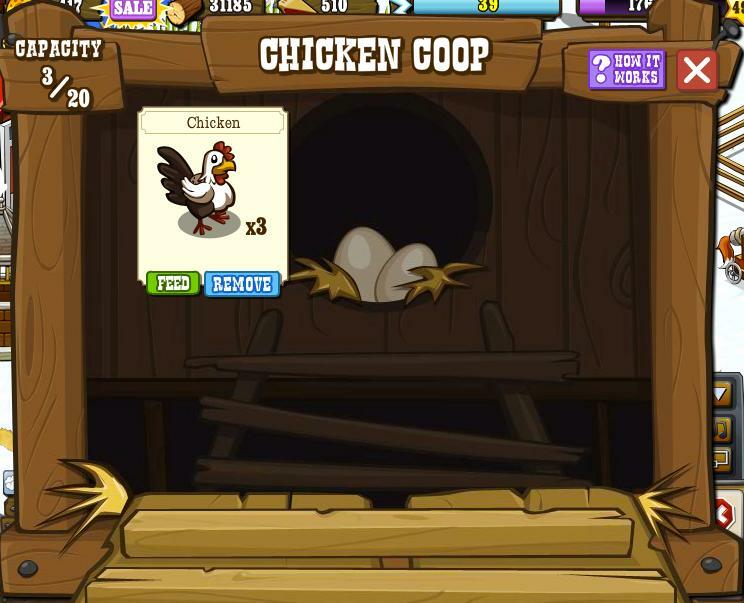 Simply use the store cursor the same as with decorations or move the chicken onto the coop to store it. They must be ADULT chickens to be stored. To collect from them you simply click the coop and open the feed dialog which lets you feed any amount in your coop as long as you have the energy, or use the daily bonus the same as before, which will also feed all the chickens outside the coop. Feeling a little under the weather? Our new Building might help. After giving a poor sick traveller a place to sleep and some home comforts the rest of your family pick up the Prarie Pox! 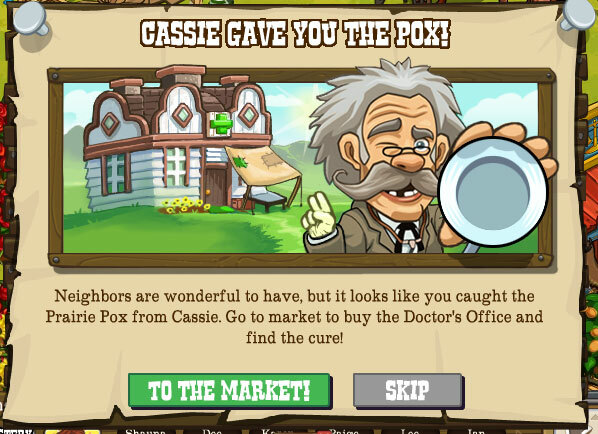 Seems it's time for something a little more medicinal than some chicken soup is on the cards and you know what that means... We'll be building a Doctors Office on our homesteads to help us get over those nasty sniffles. 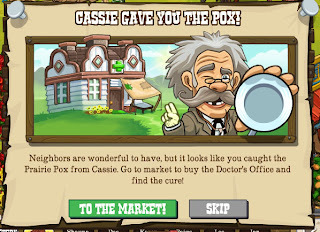 It'll even come with Doc out front, a new permanent NPC who'll give out health advice when spoken to! 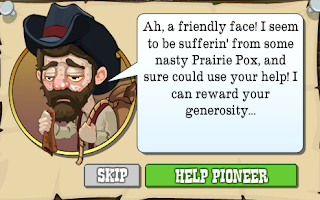 The illness will affect your avatars and need helping via a mission thread. If you visit a neighbour over Level 9 during this time you'll pass the infection on to them and begin the mission thread WITHOUT them going through the visitors part of it! 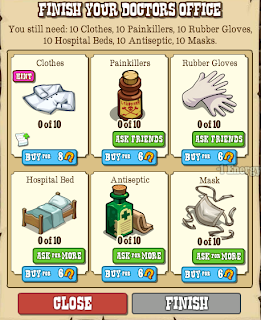 Once built it has it's own Collection (Forceps, Stethoscope, Bone Saw, Bandage, Syringe) which, when traded in, gives 100XP and Medical Supplies, which are a usable item. We'll also be getting a new tree, Peppermint, with it's own Collection too, rewarding One Peppermint Extract and 100 XP when traded in. For all the mission requirements of the five illness missions go HERE. 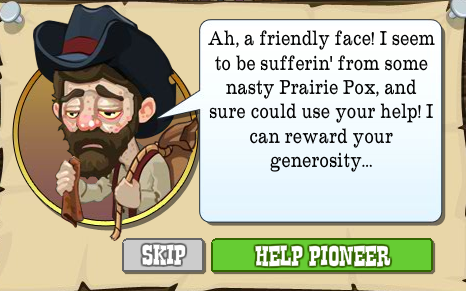 Over the next day or so we will see a new feature arrive on the Frontier - let your Animal loving instincts show by nursing injured animals back to health! You may find an injured animal on your homestead, whilst clearing grass or feeding cows and oxen . You will be alerted when you find an injured animal with a pop-up asking you if you want to help or abandon the animal. After this initial mission you will not get the mission again but you can still find more injured animals once every 1-3 days or so. IMPORTANT NOTE: You must move the Animal before healing it, otherwise it loses it's "injured" designation and you'll have to wait for another one to show up to complete the mission. If you chose to help then you will need to ask your friends to send you milk bottles to give to the animal and restore them to full health. You can get up to 5 bottles from friends who click on your post and can post every 8 hours. You can also get milk from collecting from the feeds put up by neighbours. It will take 6 bottles to restore the animal to full health. A visiting neighbour can tend your injured animal and heal it but it will use up one of YOUR critter milks, it's not counted as a freebie. Once you have nursed it to health you get to keep it on your homestead and post to share some milk bottles with friends. 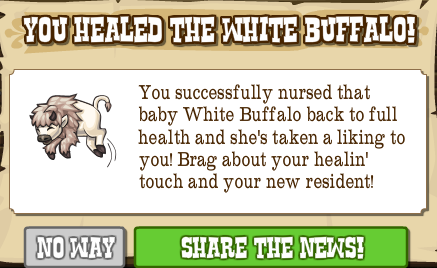 Badge 1 - Heal 3 Animals Reward 50 Xp, White Hedgehog. Badge 2 - Heal 10 Animals - Reward 500XP, 1 Horse. Badge 3 - Heal 25 Animals - Reward 1'000XP, Brown Alpaca. Badge 4 - Heal 50 Animals - Reward 2'500XP, Red Ferret. Zynga wants to hear from you!! Love is in the air in the FrontierVille Market! New Building - The Pony Express!